For the first time in Northern California, law enforcement officers throughout the Bay will stake out participating Dunkin’ rooftops to support Special Olympics Northern California! Between 6 a.m. and 10 a.m. on Friday, November 2, each guest who visits a Cop on a Rooftop Dunkin’ location and makes a donation of any amount will receive a FREE medium hot or iced coffee coupon. 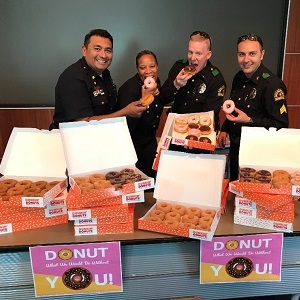 Officers will cover more than 10 Dunkin’ rooftops in Northern California in addition to the 19 Southern California Dunkin’ locations to raise awareness and donations for Special Olympics.